Back in January, I compared Reagan’s pro-trade views with Trump’s cramped protectionism. Well, here’s another video of the Gipper talking about trade. I especially like how he used “destructionism” to describe protectionism. And let’s consider exactly the kind of destruction that may occur. 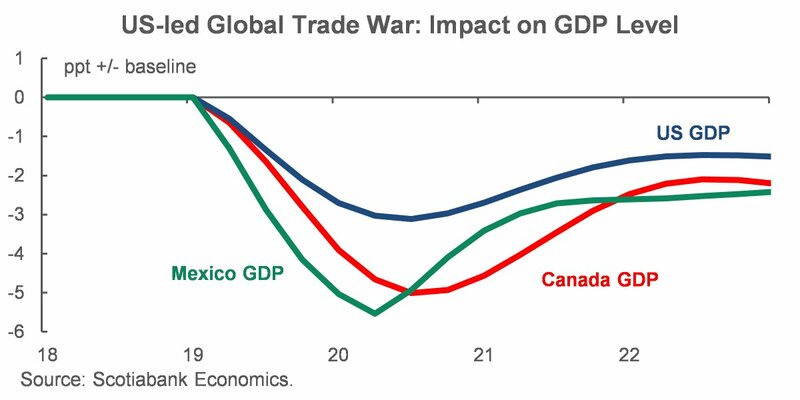 ScotiaBank in Canada has crunched numbers on the possible consequences to North America in a world of Trump-style tariffs. The “good news” is that the United States suffers the least amount of damage. The bad news (actually the worse news) is that the American people will suffer a significant and sustained loss of economic growth. And that has very negative implications for long-run prosperity. But this isn’t just about macroeconomic aggregates. Here’s an example from the Wall Street Journal of how protectionism backfires. Lyon Group Holding…is struggling to survive as Donald Trump’s steel tariff gives his Chinese competitors an unfair advantage. Meet the law of unintended tariff consequences with arbitrary harm to the innocent. …Steel has long accounted for 45% of the cost of making lockers at Lyon and Republic, the single biggest expense. Mr. Trump’s 25% tariff has driven up the price of foreign steel and given domestic steel the chance to raise prices. American hot-rolled steel coil recently sold for $900 per short ton…up 38%, or $248 per ton, since the beginning of January. …Raising locker prices isn’t an option. Even before the tariffs, Lyon and Republic’s clients were paying a 10% premium for the convenience of buying American instead of Chinese, and they can’t afford to go any higher, Mr. Altstadt says. …foreign manufacturers are benefiting from Mr. Trump’s steel protectionism. And here are some of the real-world costs. If the tariffs remain in place, Mr. Altstadt says he’ll have no choice but to buy foreign-made locker components. Reluctantly, he’s visited factories in China to consider his options. But if Lyon and Republic outsource locker parts from abroad, Mr. Altstadt says he’ll have to lay off at least one-fourth of his American workforce and perhaps shutter and sell one of his metalworking factories. …he is haunted by “the devastating effect on real people.” Two-thirds of his workforce is unskilled. I feel sorry for Mr. Altstadt, but I won’t lose sleep about his plight. I assume he’s at least in the top-5 percent for income and wealth. The real victims of Trump’s protectionism are the ordinary workers at the company. These people may not have high skills, but they are playing by the rules and doing the right thing instead of living off the government. Yet now many of them may lose their jobs because the President doesn’t like America’s system of free enterprise. Disgusting. Protectionism isn’t just bad economics. It’s immoral as well. P.S. Reagan’s rhetoric on trade was perfect, but not his policy. As I explained last year, his generally strong economic record was marred by some protectionist initiatives. I agree with everything you have said above except that you seem to view Mr. Altstadt as not sufficiently real victim. And only the ordinary workers as very real victim. You did not say so directly. May be I am interpreting it that way. But – Journalists, analysts, and OpEd writers are unjustly hostile to top 5% and even more so to top 1%. These days everyone is happy to be hostile to rich. In fairness to Mr Trump, he has said that the point of his tariffs is that it is a negotiating tactic to get other nations to reduce their trade barriers. i.e. his ultimate goal is freer trade, with terms more advantageous to America. Is Trump’s method of negotiating going to end up with a good deal for America? I don’t know. Surely even he would admit that it brings at least short-term pain. If in the end it works and he gets other countries to lower trade barriers, he’ll be hailed as a free-market hero. If it fails and we end up with more trade barriers all around, he’ll be remembered as a fool or a villain. It’s a gamble. Trump is negotiating not setting trade barriers. I think that you are missing the point. It won’t come to any seriously lengthy protectionism. The guys on the opposite side of the table will easily have to fold first and we’ll get a more just deal. I will concede that I do not have perfect and complete understanding of all the impacts of different trade policies, but, I must point out that the use of the term “growth” suggests where the problem with so-called free trade might be. Economic “growth” is not the same as increases in economic “Wealth,” nor necessarily the same as improvement in economic conditions for the average person within a Nation. Since we all know that Globalists and Libertarians hate Nations and hate Nationalists we cannot trust them to be honest about the consequences on Nations of their free trade policies. When the Globalists and Libertarians warn us of a loss of economic “growth,” we must ask, “who benefits from so-called growth, and how is that different from an increase in national wealth?” Economic growth is transactional; and increase in transactions is what increases the GDP. But wealth implies real improvement in economic conditions, whether quantitative or qualitative, not just more activity that may or may not profit the average slob living in the free trade zone. I figured on my own 40 years ago when I was in college that “GDP” was a garbage number that didn’t mean jack squat when it came to explaining the economic health of a nation. So, why would I care much about nominal increases and decreases in a garbage number?